Machu Picchu is a worldwide known example of ancient Peruvian architecture. Peruvian architecture is the architecture carried out during any time in what is now Peru, and by Peruvian architects worldwide. 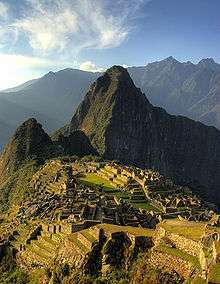 Its diversity and long history spans from ancient Peru, the Inca Empire, Colonial Peru to the present day. Peruvian colonial architecture is the conjunction of European styles exposed to the influence of indigenous imagery. Early academia has tended to view the Spanish architectural and religious takeover as complete and swift, but revisionist history emphasizes the lasting role of the indigenous in religious architecture. Two of the most well-known examples of the Renaissance period are the Cathedral and the Santa Clara church in Cusco. After this period, cultural mixture reached richer expression in the Baroque. Some examples of this Baroque period are the convent of San Francisco de Lima, the church of the Compañía and the facade of the University of Cuzco and, overall, the churches of San Agustín and Santa Rosa of Arequipa, its more beautiful exponents. The wars of independence left a creative emptiness that Neoclassicism of French inspiration could just fill. The 20th century is characterized by the eclecticism, to which the constructive functionalism has been against. The most considerable example is Plaza San Martín in Lima. ↑ Christopher Wang, "Colonial Architecture of the Viceroyalty of Peru: The necessary and continued role of the indigenous in Christianity." Accessed 13.08.2013.